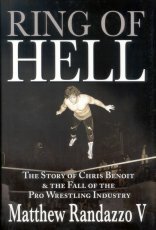 In Ring of Hell: The Story of Chris Benoit & the Fall of the Pro Wrestling Industry, author Matthew Randazzo V explores the events leading up to the grisly demise of World Wrestling Entertainment superstar Chris Benoit. In an unexpected, although not altogether surprising, fit of madness in June of 2007, Benoit strangled his wife, choked his seven-year-old son to death, and then hung himself from his own weight machine. Beyond Benoit's twisted story, Randazzo's shocking exposé delves deep into the scandals and cover-ups of the global wrestling industry -- where drug addictions, sociopathic superstars, and broken families are the norm and situations like Benoit's are all-too-often ignored. Bringing to light previously unpublished stories of racism, drug abuse, sexual misconduct, and organized crime ties, at long last Matthew Randazzo V reveals the dysfunctional, sadistic, underbelly of the multi-billion-dollar wrestling business; the Ring of Hell that ultimately engulfed Christ Benoit. Chris Benoit's previously unknown record of barbaric, psychopathic behavior; foresight that may have prevented his brutal killings. An in-depth look at the causes of Benoit's gruesome psychological meltdown, including the catastrophic brain injuries he sustained in the ring and years of amphetamine, steroid, alcohol, painkiller, and psychiatric drug abuse. The appalling reasons why pro wrestling superstars suffer from an occupational mortality rate more befitting of inner-city drug dealers than international TV celebrities. An insider's view of the Japanese wrestling industry, the second-largest in the world, whose operations are secretly run by the blood-soaked Yakuza Mafia. A behind-the-scenes exposé of the outlandish McMahon family, the billionaire dynasty whose business practices have perpetuated the destructive meat grinder that is the wrestling industry. Can the exploitative pro wrestling industry ever be reformed?